The Movement for Good Governance, together with partners Youth Vote Philippines and Mulat Pinoy, gathered a group of concerned citizens to evaluate the 2013 senatorial candidates* using MGG’s criteria of Effective, Empowering, and Ethical leadership. 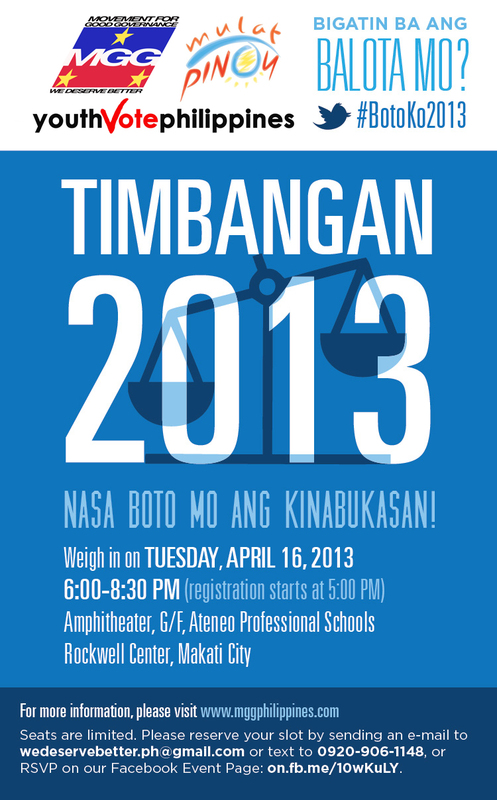 The event, dubbed “Timbangan 2013,” was conducted on April 16, 2013, at the Amphitheater of the Ateneo Professional Schools in Makati. Voters of all ages, from students to working professionals to senior citizens, participated in the exercise. The objective of Timbangan was to present voters with an objective criteria for evaluating candidates and to determine whether voter preferences changed after they applied the criteria. 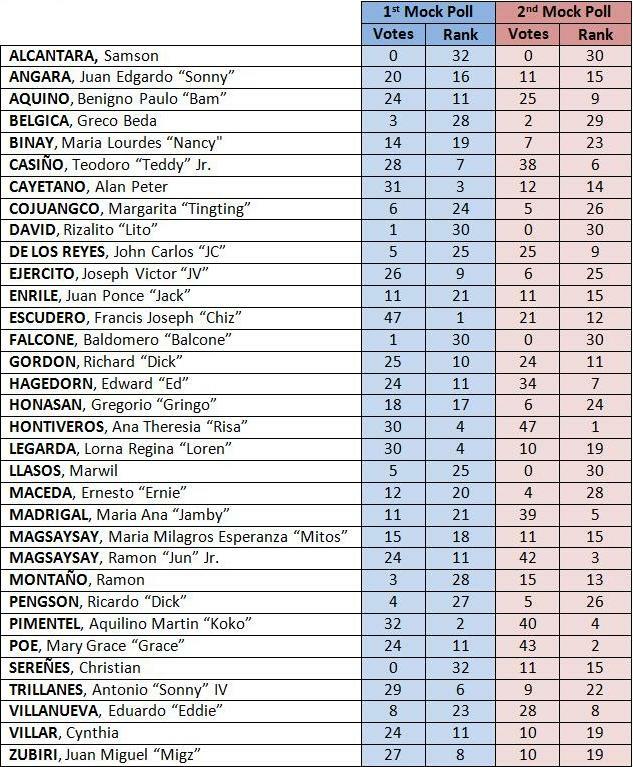 MGG conducted two polls: one at the beginning of the event prior to the introduction to the scorecard, and a second at the end. After casting their initial votes, the participants were briefed on MGG’s leadership criteria and the use of the scorecard. A panel, led by MGG Chair Solita Monsod, then engaged in a lively discussion about the candidates’ qualifications. Prof. Monsod was joined by former Finance Secretary Roberto de Ocampo, former Comelec Commissioner Augusto Lagman, former Governor Rafael Coscolluela, and Ateneo School of Government lecturer Joy Aceron. The panelists were asked to identify which of the candidates, in their opinion, met the scorecard criteria. They did not always agree and the audience were left to form their own opinions on the candidates based on various inputs. As they listened to the panel discussion, the participants scribbled down notes, referred to their candidate briefer, and gradually filled out their scorecards. 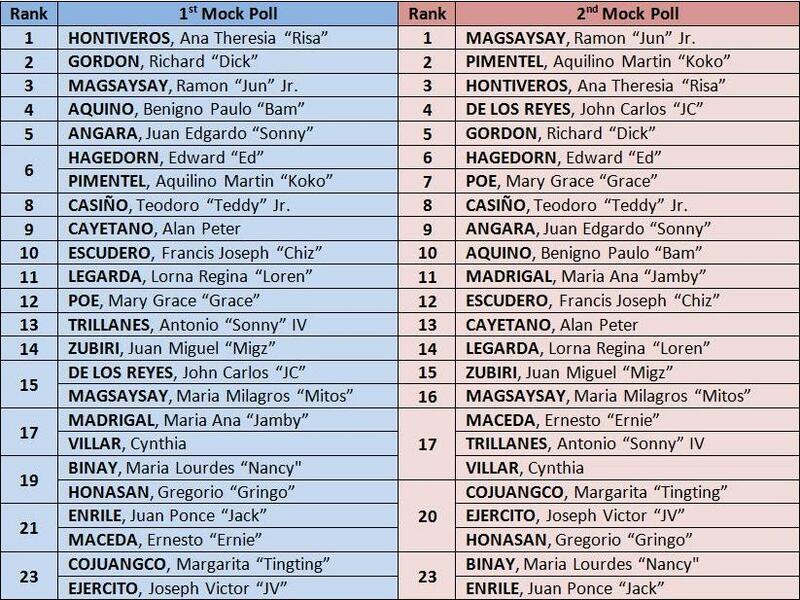 The event concluded with the participants casting their votes in the second mock polls. Though it was nearly 9:00 PM, the participants stayed as MGG volunteers tallied the votes. The feedback that MGG received was overwhelmingly positive. The participants found the process of benchmarking to be very effective in helping them decide which candidates deserve their vote. Some came to the event feeling unsure of their choices but left feeling much more confident. Others were very sure of their initial choices, but subsequently changed their minds. Timbangan’s results show that using a scorecard can significantly change the way people vote. 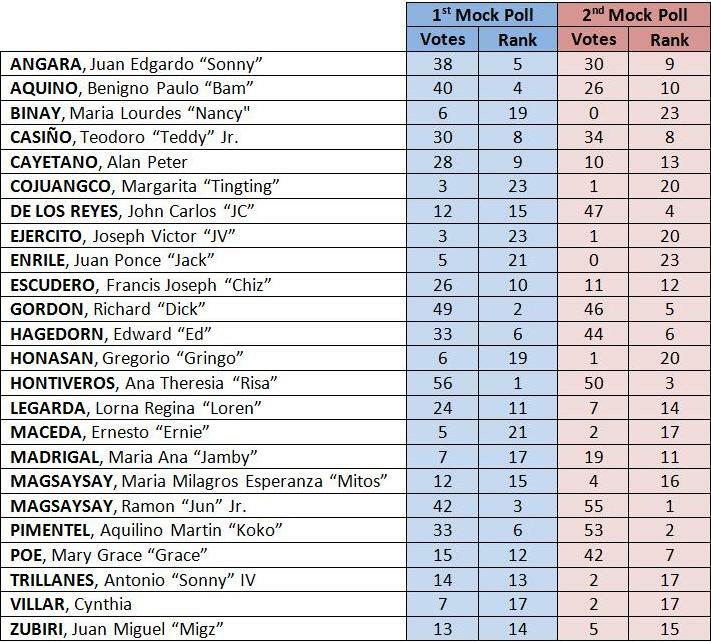 *Due to time and logistical constraints it was not possible to discuss all the candidates, so this Timbangan was limited to the top 24 in the surveys (at the time we started preparing for the event). We are currently exploring the possibility of holding other Timbangans, to include a wider set of candidates, and to engage more voters. 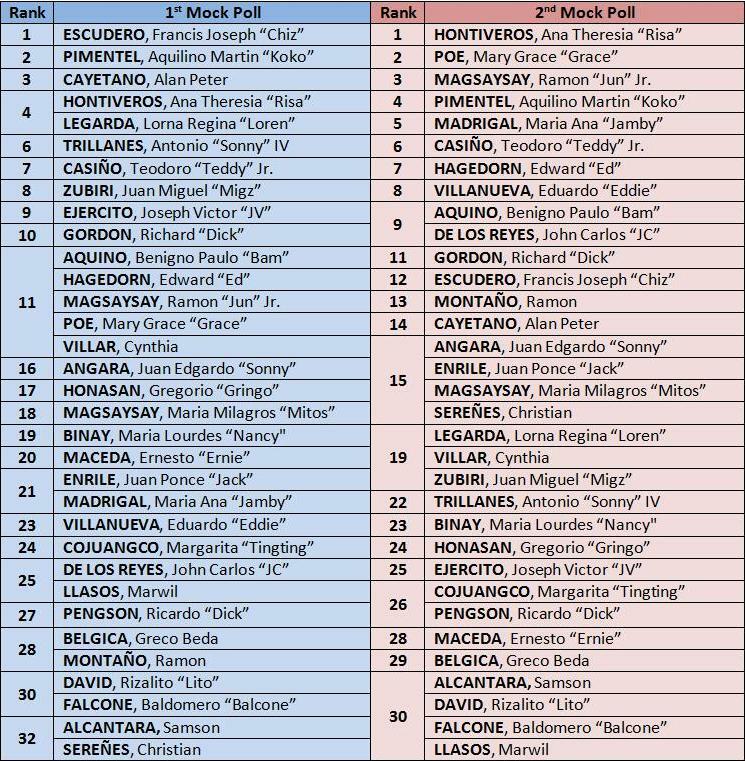 The Movement for Good Governance (MGG), together with Youth Vote Philippines and Mulat Pinoy, invites all concerned citizens to Timbangan 2013, an exercise in evaluating the 2013 senatorial candidates. Do those seeking office meet MGG’s criteria of effective, ethical, and empowering leadership? Let us know what you think. We look forward to your participation on April 16, 2013, Tuesday, from 6:00 to 8:30 P.M. at the Amphitheater, Ground floor, Ateneo Professional Schools, Rockwell Center, Makati. The program is available here. A panel led by MGG Chair, Prof. Solita Monsod, will discuss the qualifications and track records of the top 24 candidates. 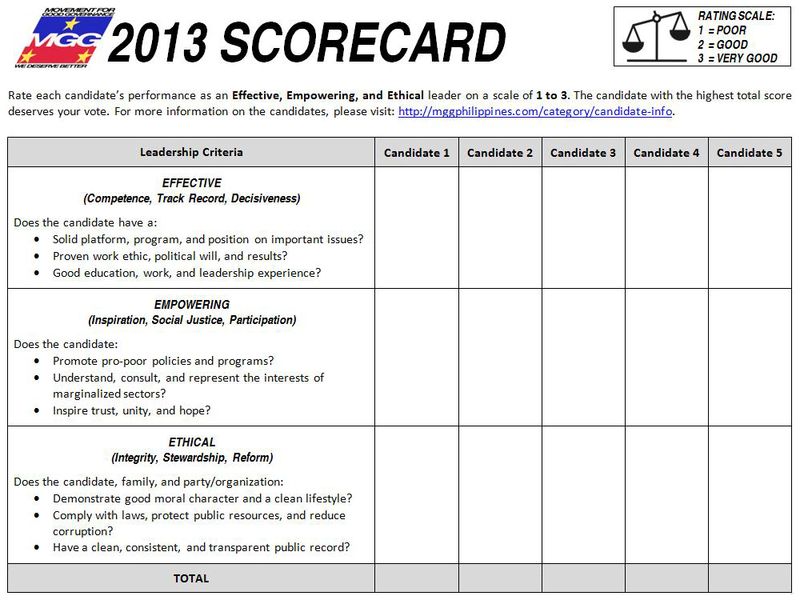 The event will start and end with a mock election, to determine whether or not audience preferences changed after the candidates were rated using the MGG scorecard. Entrance to the event is free and all are welcome to attend. The Timbangan Team is extending a special invitation to Pinoy bloggers who would like to live blog during the event. To confirm your attendance or for further information, please send an e-mail to wedeservebetter.ph@gmail.com or leave us a message on Facebook. Follow @MulatPinoy and @MGGPhils for livetweets! Join the conversation by using the hashtag #BotoKo2013.